This delightful disc is inspired by the writings of Christine de Pisan (1364-1430) who, remarkably, produced a wide body of romantic poetry as well as Livre des fais d'armes et de chevalerie (The Books of Feats of Arms and of Chivalry) which just about defined chivalry and modern warfare for the Middle Ages, including the idea of the just war (fought by Kings in the name of God). 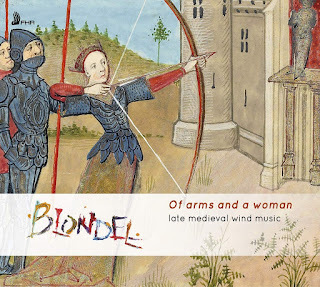 There is only one surviving contemporary setting of Pisan's poetry, so here we have a wide selection of chansons which reflect the themes of her work in versions for Medieval wind ensemble performed by Blondel (Louise Anna Duggan, Emily Baines, Daniel Serafini, Lizzie Gutteridge and Belinda Paul) on First Hand Records. Whilst many of the works on the disc are anonymous, we also have music by Dufay, John Bedyngham, Gilles Binchois, Johannes Ciconia, Baude Cordier, Guillaume de Machaut, Solage, Robert Morton, Francesco Landini, and Josquin des Pres. The result is 24 short tracks which engage with the melodic freedom of the music and delightful imagination of the scoring. Blondel use a mixture of instruments, recorders, shawms, bagpipes, slide trumpets, sackbuts, frame drum tabor and tamburello, so that each item has a sound world matched to it, from the martial combination of shawms, sackbut and tabor to the more gentle ensemble of three recorders. For the anonymous Allez a la fougere we have the amazing sound of three bagpipes, and for Machaut's Aymi! dame de valour bagpipes and tamburello. The playing is wonderfully engaging, and the players revel in the variety of colours that their instruments can achieve, whether it be the meaty sounds of the shawms or the gentler recorders. Whilst there is a freedom to the playing, there is less feel of improvisation than on some recordings of this music. 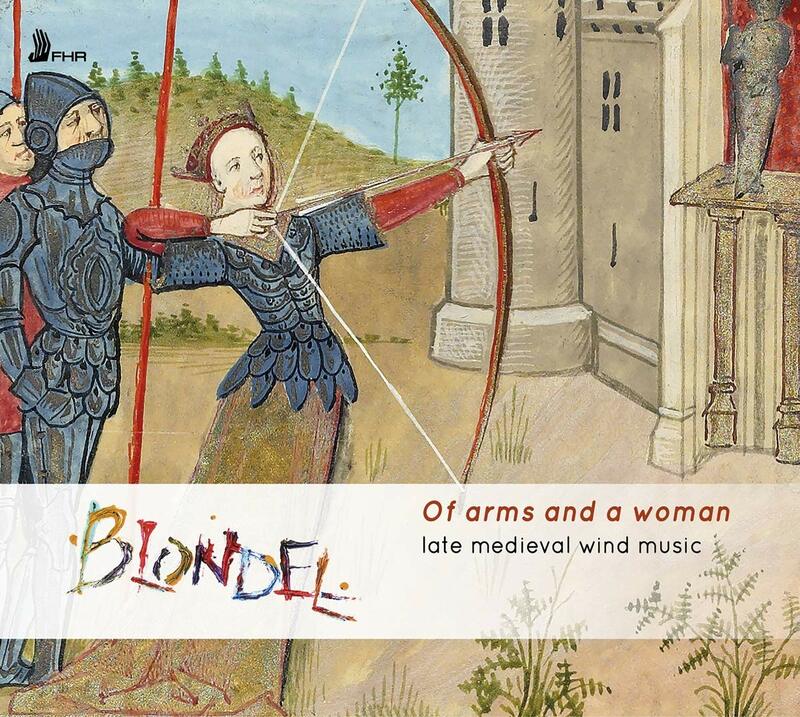 Blondel does not come over as a medieval jazz band, and they seem to stick quite closely to the original chansons, in fact the CD booklet is careful to highlight the items (just two) which are arranged by members of the ensemble. The CD booklet gives a fine background to the life and work of Christine de Pisan, and helpfully provides detail for each of the tracks, complete with the original text of the chanson and some background to the work. What we don't really get is an overview of why these particular songs were chosen, nor are we told what we are listening to. Are the players simply playing the multi-part chansons, replacing voices with instruments, or are they using manuscript sources which were intended for wind players. Given the academic detail in the CD notes (we are told which manuscript each item comes from), this sort of thing would be nice to know.